For those making their own way there, the full address to put into Google Maps is Callendar Park, Falkirk, FK1 1SY. A copy of the course can be found here and a copy of the race timetable can be found here. 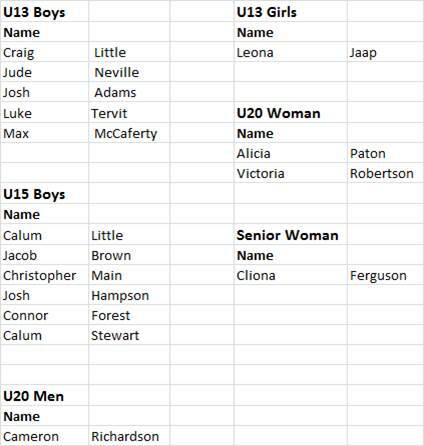 Both Frankie and Stephen will co-ordinate both the Tent and Declarations, can all Athletes please make sure you are at the Club Tent no later that 90 mins before your race. As well as the cross country races themselves, there is a another special event happening at this years National Cross Country – a number of Clubs including ourselves have signed up to take part in a National XC Bake Off Charity Competition to raise funds for the well deserving Charity – The Beatson Institute. A number of the Club Coaches, Officials and parents have kindly agreed to bake an assortment of cakes, which on behalf of the Club I would like to say a special thanks to everyone for doing so, as well as those who have kindly agreed to look after selling them on Saturday!